Faith United is a multi-denominational (PCUSA and UCC) community of believers serving in the lake shore community of Oswego, New York. 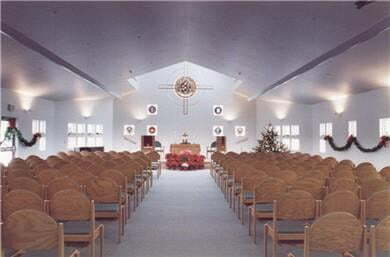 Our Mission to the community is an active focus on both physical hunger (Souper Bowl of Caring, CROP Walk, serving meals at the local Soup Kitchen, collections of food for our local food pantry) and spiritual needs (weekly and special worship services) and a church building that is totally handicap accessible, hearing amplified, and ecologically friendly. A New Pastor is on the way! On Sunday, March 24, 2019, the congregation of Faith United Church voted unanimously to extend a call to Andrew Hinman to become our next settled pastor. Andy's official start date will be May 1st. Andy is currently the pastor of Bristol Hill Congregational Church near Fulton, NY. Andy has expressed a commitment or calling to serve smaller congregations that need part-time pastors and it is his intention to continue pastoring the Bristol Hill church in addition to pastoring Faith United. Andy is also the registrar/treasurer of the Oneida Association of the New York Conference of the United Church of Christ. Andy and his family live in the city of Oswego. Beginning Sunday, May 5th, Sunday Worship time for Faith United Church will change to 9:15 am. Children's Sunday School will still occur during worship. Coffee hour will follow worship. Adult study will commence at 10:30 am. Our new pastor will be serving not only our church but one other church as well. Both churches have changed their worship times in order to make this possible. Turn left at the first traffic signal on to Utica St. Turn left at the second traffic signal on to W. 5th St.
Travel south on W. 5th St. for 1.4 miles. Turn left on Mark Fitzgibbons Dr.
Travel 0.2 mile, church is on right. Drive to the center of town, crossing the Oswego River. Turn left at the 3rd traffic signal after the bridge on to W. 5th St.
Travel south on W. 5th St. for 1.7 miles. Enter city of Oswego on rte. 104. Continue on rte. 104 until you reach W. 5th St. Turn right. "No matter who you are, no matter where you are on life's journey, you are welcome at Faith United Church." We continue to collect donations of peanut butter, jam or jelly in plastic containers. This is a nation-wide program to help feed children with limited access to food. Thank you's to all who made this year's Easter Egg Hunt a big success. Nearly 70 children participated. Special Meeting of the Congregation following worship on Sunday, April 28th to approve sale of the warehouse property. First Worship Service with our NEW PASTOR, Andrew Hinman Reminder: Worship service will now start at 9:15 am. Annual Meeting of the Congregation of Faith United Church: followed by brunch.